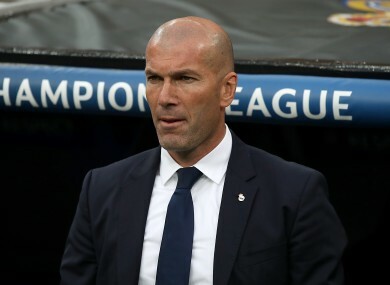 ZINEDINE ZIDANE INSISTS he will have no divided loyalties after leading Real Madrid to a second consecutive Champions League final where they will meet his old club Juventus on 3 June. Real withstood a first-half onslaught from local rivals Atletico Madrid to progress 4-2 on aggregate despite losing 2-1 in their semi-final, second leg on Wednesday. Italian champions Juventus await, who Zidane left for a then world record fee when he first joined Real as a player in 2001. “For sure it is special because it was a very important club for me as a player. It is a club that also gave me everything,” said Zidane. “I can’t do anything about it now,” added Zidane. Ultimately, Cristiano Ronaldo’s first leg hat-trick proved the difference as for the fourth straight season Real eliminated Atletico from the Champions League. Atletico had threatened an incredible comeback, Saul Niguez’s powerful header and Antoine Griezmann’s penalty inside 16 minutes cutting Real’s aggregate lead to a solitary goal. However, Isco’s away goal just before half-time settled Real’s nerves and left Atletico with too much to do to progress. “We knew they would start very strongly,” said Ronaldo. “They had the luck to score two goals but we know that if we scored that would kill them. Real can now make history by becoming the first side to retain the trophy in the Champions League era. However, Zidane preferred to highlight the strength of his squad rather than his own role in a remarkably successful run since he took his first senior managerial job 17 months ago. “I am delighted. I am the coach which means I am doing something right, but everyone in this squad is doing a phenomenal job. Real were without the injured Gareth Bale for both legs of the semi-final. However, Zidane is hopeful the Welshman could be fit for a homecoming final in Cardiff. Email “Zidane promises no divided loyalties with Juventus at Champions League final”. Feedback on “Zidane promises no divided loyalties with Juventus at Champions League final”.